For locking your lesser cases and wooden boxes. 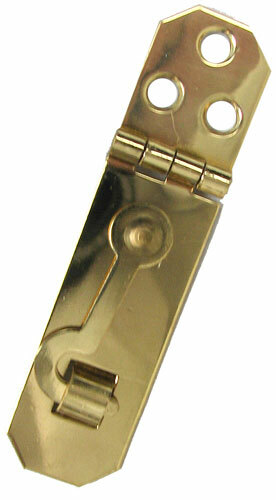 Our each is a small brass hasp, 3” long x 3/4” wide, with attached hook. Includes mounting screws. If your little wooden box is French, this is a moraillon avec crochet. We’re just saying. 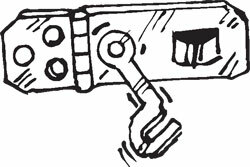 This simple, clean-lined chromed cabinet latch will tell every visitor to your home that you're standing right at the cutting edge of elegant home design. 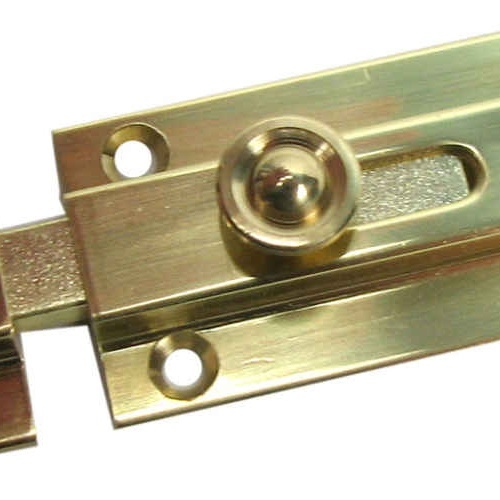 Each latch is 3/4" x 1-3/8" long with a 1-3/8" x 5/8" plate and a 1-1/4" long handle centered on a tasteful dome. Includes a mounting nut. Made in the USA. Handles-R-Us. 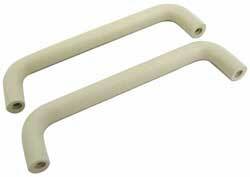 In the spirit of pure surplus, we’ve got these 1-7/8" long x 3/8" aluminum handles for a mechanical counter. Sized for a 5/32” ID shaft with a set-screw to tighten it down. If you don’t have any handle-less mechanical counters, put a handle on something else. 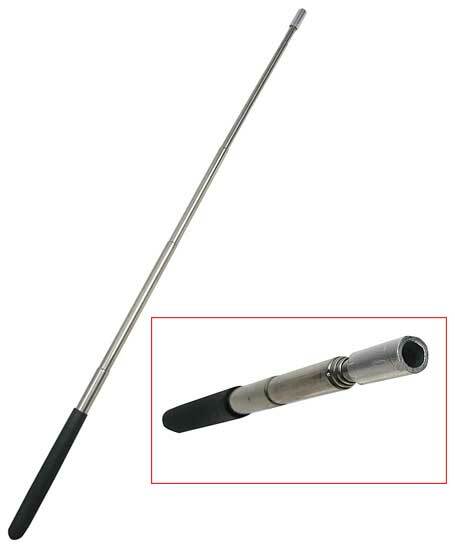 It’s a 5-draw extension shaft that extends from 7” to nearly 26”. One end has a padded black rubber handle and the other has, well, nothing. To be fair, it has a 3/8” long metal cylinder with a 7/32” ID at the business end, but for what, we don’t know. We suspect it was on its way to being some kind of pick-up tool but got distracted. As is, it’s a dandy pointer or the beginning of a clever something that you’re going to invent. It’s not for your serious security needs, but it will probably keep a 9-year-old out of his sister’s diary. 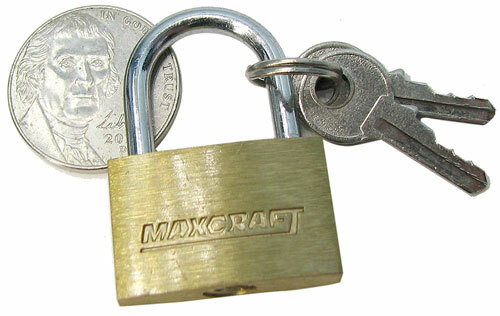 Our smallest brass padlock measures 1-1/4” tall with a 5/8” shackle, and comes with (2) tiny keys. Lose your keys much? Lock them to a belt loop and put the key in your shoe. Some people might think these drawer pulls are too cute by half, but some other people will think they’re just adorable. You know who you are. 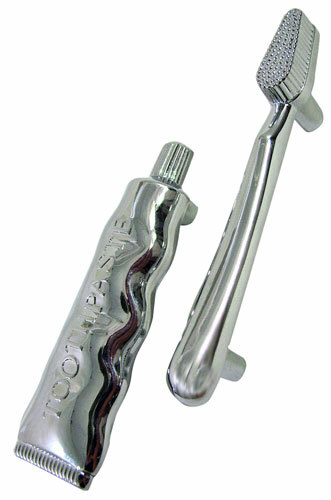 Our each is (2) bright chrome cabinet pulls, (1) mini toothbrush and (1) small tube of toothpaste, thoughtfully labeled “toothpaste.” Measure 4-3/8” long (brush) and 3-7/8” long (paste). 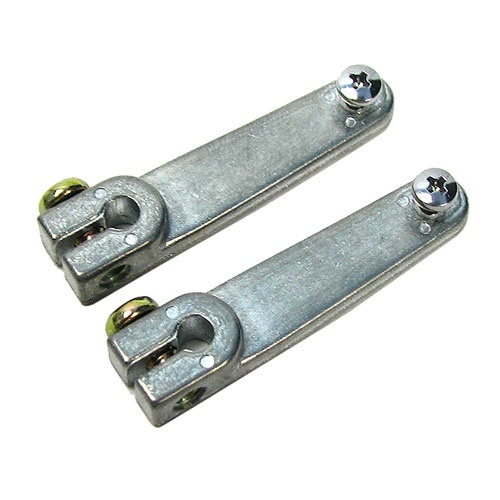 Both have 3” center-to-center mounting stems and include mounting screws. In a world of electroplated dreck, solid brass hardware stands alone. (It’s the cheese of the hardware world!) 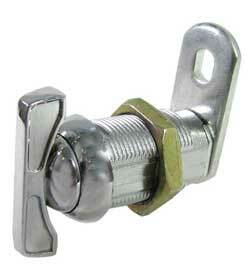 This is a 1-3/4" x 1" solid brass slide bolt from Stanley® with a 5/8” throw. Comes with brass mounting screws.